It’s the lazy part of my human nature that tells me there is a secret formula I can follow for perfection in motherhood and my homeschool. Unfortunately for most(all) of us, that simply isn’t the case. We strive for perfection, yet God doesn’t call us to that. He calls us to rely on Him in all that we do and follow His plan for our life, including our homeschool. It is strenuous work not to have that formula because then we have to make our own way. Don’t ever forget that when it comes to your own homeschool it doesn’t have to look like your best friends, your parents or that family from church. It is your very own and that is one of the things that makes homeschooling so fun is that it is unique to your individual family. It’s easy to feel fearful when you think about it that way. After all what if this homeschool journey just doesn’t work out? As a mom, what if I don’t have what it takes? We all have our doubts but with God’s help we can fearlessly tackle each homeschool insecurity one at a time. So this isn’t a list for getting it all right, it is my observations from the time I was small all the way through living the life of a homeschool mom. There is no way to do everything perfect, and even through the overwhelming moments my kids are learning! I want to live this homeschool journey fearlessly, to me that means going to sleep each night with as little regrets to my day as possible. 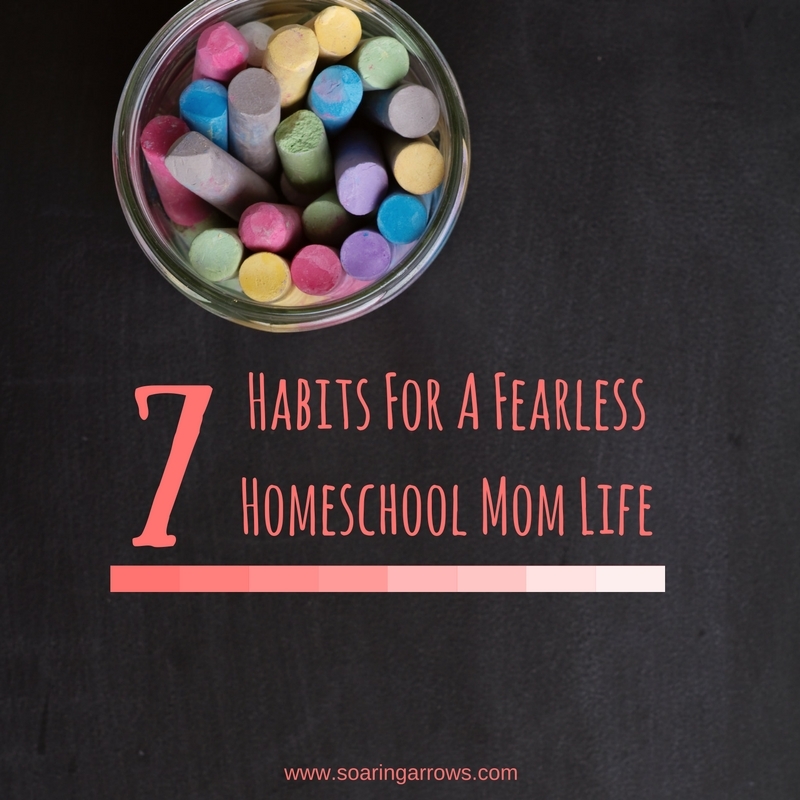 There is no perfect formula, there is only my best and here are 7 ways I tackle my homeschool days with my best foot forward. This is so much more than mom having a quiet time with God, memorizing scripture or character training, all of which are very important to me. It is about remembering Who is really in control of our homeschool, and praying throughout the day as troubles or problems arise. I have to remember that God is in control of it all and has chosen me as the best mom for my littles for a reason. God knows if you are having a rough school day or a rough school year. He sees the big picture and goes before us, knowing if the next day or year will be more difficult or more laid back for you! So pray for peace and understanding, remember that God has got it and listen to the holy spirit when you are feeling convicted to make changes. When God is whispering to you, I got this, just rest in that! I cannot emphasize this enough. Even though my husband and I both grew up homeschooled, he was reluctant to homeschool our own kids because of the tough family background he had come from. At first this was such a shock to me. In my immaturity I wished it was a decision I could make whether or not he was on board. After many difficult conversations between us I felt God calling me to be still, quiet and pray. I knew I couldn’t do this huge job ahead without my husbands support. Just as my oldest daughter would’ve needed to get signed up for preschool an amazing thing happened. A family we knew, who had awesome kids that attended school, suddenly decided to homeschool. Not only that but their Dad started talking to my husband about homeschooling. Next thing you know, the conversation was back on the table and this time my husband was open to giving our family, our own chance at homeschooling. I had to promise him that I would work hard to keep our family atmosphere pleasant, something that was often lacking in his family. If I couldn’t do it that way, we would put our kids in school. Well that was 4 years ago and I can honestly say if I had coerced him into homeschooling, it would have been so much harder on my whole family. Because God called me to patiently wait it out through prayer, my husband is 100% on board now. Having his support is critical to my success as a homeschool mom. I need him there to listen to me talk through curriculum choices, help me deal with my struggling reader or ready to take over so I can have a night out after a long day. I trust his lead and if he feels it’s time for us to reevaluate our school plans, we will be reevaluating together! Instead of trying to turn your home into a school, allow school to be a part of your home. Home should be a place that is warm, an inviting place where your kids find comfort and refuge. As soon as your home starts feeling too much like school, the atmosphere is going to suffer. The atmosphere of the home might be one of the most important parts of a successful homeschool. This is one reason I don’t have a huge homeschool space. We have our homeschool space as part of our playroom downstairs but it follows the 80/20 rule! It’s about 80% fun with 20% school and the rest of the house is 100% our home! Occasionally we will bring workbooks up to the dining room table or read aloud books will travel to the living room up stairs, then the materials all return back to the school area. That way the rest of our day is spent just feeling at home together! Some of you might have a bigger homeschool room, or everything spread all over the house, and that’s ok! You can still make it feel like home in a way that works for your family. The important part is keeping that in mind throughout the school year and making space for home in the midst of school. The longer I homeschool, the more I see the value in this. When my kids are grown, I want them to long to come back home not to our oversized classroom! I adore being my littles teacher but sometimes I just want to be their Mom. I have only just scratched the surface of what this means but it thrills me to think about striving to become an awesome adult. Most of us have loads of talent, as I became a mom I put my talent aside to raise my young babies and toddlers. Those years are priceless and I wouldn’t trade those moments for anything! For a time my littles were fully dependent on me but that is no longer the case. Now that my kids are getting older I’m seeing the value in showing them my interests especially as they begin to explore theirs. This can feel selfish at times but what it shows them is that becoming an adult isn’t something to dread, but something to aspire and look forward to. Dare to dream that growing up can be a fulfilling part of life beyond even your career. You don’t need a career to be an awesome adult. Some would say I’m “just” a mom but there is a whole lot below the surface they know nothing about. If other adults never know those hidden talents I have, that will never bother me, but I want to show these talents off to my littles. Not only will it bless them with memories of the things I did that they thought were amazing, it will also give them a reason to pursue their own unique gifts! If they can see me be brave and try new things, they might just join me and try something new themselves. This is a huge job we wake up and complete each day! Stay focused on the end goal and make a point of keeping distractions away. Because I am still teaching very dependent littles as well as taking care of a toddler, this means I often have to say no to outside activities during the day. It won’t stay that way forever but right now, that is my reality. If we say yes to something it’s because it’s important on our priority list that year, like one of my kids taking a class one morning a week! Otherwise school time is school time. Each day my list of to-do’s could easily pull me away from a whole day of teaching. I have learned to walk away from the laundry, canning I want to do, errands that need to be run, phone calls that need to be made and go do my most important job which is teaching my kids. As crazy as it may seem, I usually do have time to get the other things done later, but I do the most important part of my day done first which is teaching. After teaching I get back to my wife and mom duties. When the motivation levels are down and I don’t feel like doing school that day, I keep it up. I don’t always feel like teaching but once I get started usually we end up having a pretty productive day and my lack is forgotten once we get going on lessons. Homeschooling our kids does not mean we need to spend every minute of the day with them. In the afternoon I try to get at least an hour of quiet time. This gives my kids a chance to go do something on their own quietly while I recharge my drained batteries. During this time I do not clean the bathrooms or fold laundry. I enjoy this time as it is usually the only break I get during the day. There is no way for me to thrive as a Mom without these moments of quiet. Getting out of the house alone is important to my homeschool mom life as well! I might just leave alone one night a week to go grocery shopping, run errands or go out with my girlfriends. I make it my goal to have one night out a week. Here is another time my husbands support has come in very handy! He is happy to give me the time away and my littles have a blast having a dance party with daddy and he puts them all to bed before I get home. It is amazing how recharged I feel after that! Have I mentioned too how happy my kids are to see me the next morning? It’s okay for the littles to miss Mama every once in a while. My desire to bring enchantment to our homeschooling is thanks to the encouragement of Julie Bogart with Brave Writer. If you don’t follow her on Periscope you should! There is a whole wealth of ideas to brighten up our school day. Some things just need to get done but there are plenty of times I could have sprinkled some magic enchantment dust over our school day and before, I would bypass it for the sake of time. The days get tedious for both mom and littles when we forget to do this. It can be difficult to overhaul something all at once so this year it is my goal to do add enchantment at least once a day. That would go a long way with my kids! So take that walk outside to see the birds nest, have tea alongside poetry, listen to the music of the time period you are studying, actually do the science experiments or play that math game. This won’t just bring joy to your kids, but it will bring joy to you as you see their excitement! Being a homeschool mom doesn’t mean you have to be a boring mom! Try something new this school year. This homeschool lifestyle is meant to benefit the whole family, including mom. So fearlessly chase after your best homeschool year yet. I wouldn’t change anything. I did the best I could during the 15 years that I homeschooled my kids and try to live in the moment. All of my kids are young adults and turned out to be productive, loving, God fearing people. The advice I give to those starting out is to instill a love of learning in your kids, focus on shaping their character and have as much fun as possible. Your kids will remember all of the good times and know you loved and cared about them.